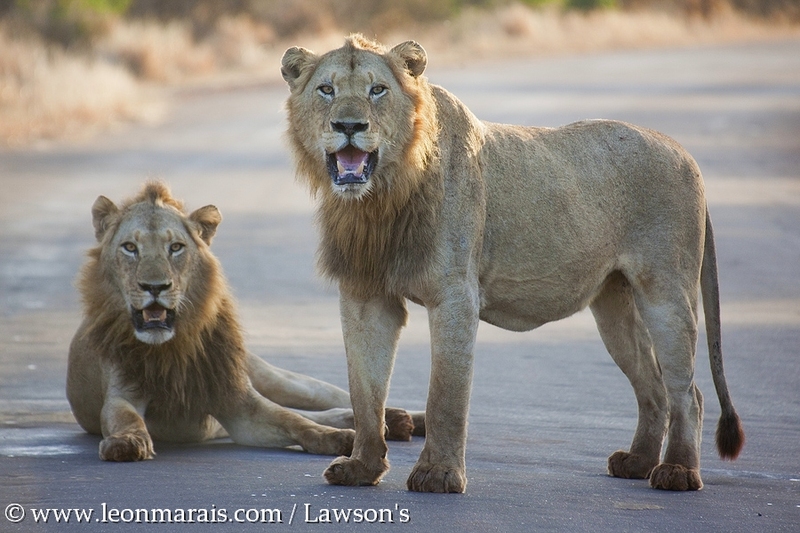 cats | Leon Marais Travel Writing and Photography. Buffalo vs. Lions: Battle won, War lost. I was leading a birding tour with some American birders in September and we were staying at Satara Rest Camp. For our full day’s morning program we made our way down to Sweni Waterhole, the Sweni Road being one of my favourite routes in the area. It was very dry and I suspected that the waterhole would draw in a lot of game. Approaching the water we ran into a large herd of Buffalo, all grazing peacefully. We were spotting Yellow-billed Oxpeckers on the bovids when I noticed a number of cars parked at the waterhole. ‘Hey guys’, I said, ‘looks like there’s something a bit more interesting at the waterhole’. So we made our way over and immediately spotted the bright crimson of the open carcass, with a big furry head next to it. Lions on a kill! And there were plenty of Buffalo in the immediate area too, some of which were showing interest in the Lions. I tried to park at the waterhole, but with the other cars and the bushes there was no way to get a view there, so I had to pull back a bit for a broader view of the scene. But the clients were happy and we sat back to watch the action. We could see that the Buffalo were on the offensive, a group of ‘Dagga Boys’ pushing as a group towards the carcass with heads swinging and much snorting. The Lion at the carcass at the time was also growling loudly, hissing and spitting at the Buffalo, determined to finish eating their fallen comrade. But still they came, and eventually he decided to give ground, running straight towards us with a few bulls giving chase. Interestingly, one bull at the carcass hooked horns with it and began tossing it around in anger. My take was that he could still smell the Lions strongly, and anything that smelled of the enemy was a target. At this point a few Black-backed Jackals moved in, one of them seeming to hold off a Buffalo bull on his own, much to the delight of the Americans (though I suspect the Buffalo wasn’t actually too concerned about a weeny Jackal). All the while there was plenty of game looking on, waiting for things to quieten down so they could come and drink. 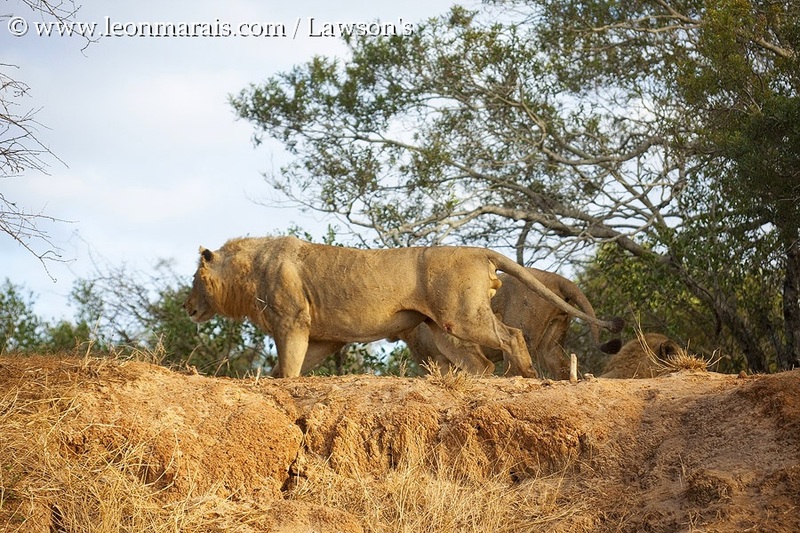 Eventually the Buffalo began to move off, and Lions appeared from all over to finish their spoils – five males in total, quite a potent force indeed (to put it mildly). All in all it was a fantastic sighting, one of my best ever in fact. With the Buffalo closing in the Lion eventually decides to give way to the swinging heads, thrashing horns. 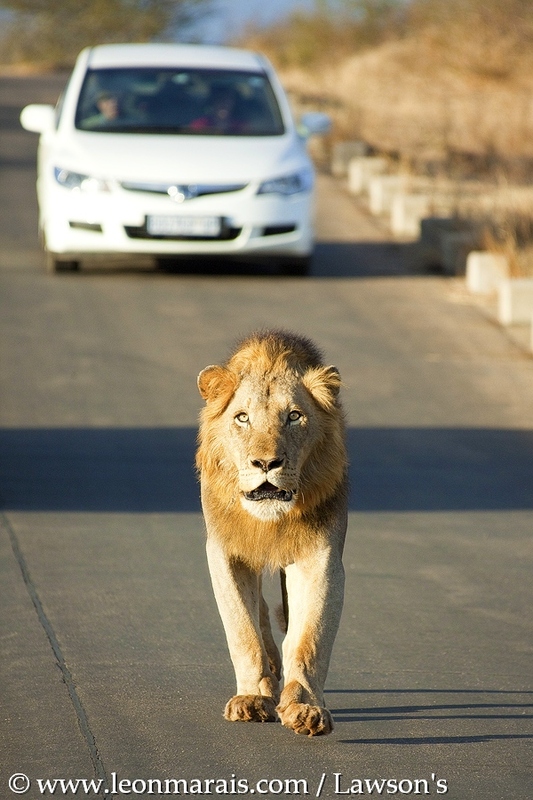 The Lion opens up his stride, accelerating away from the Buffalo. One Buffalo bull attacks the carcass, perhaps enraged by the lingering smell of the Lions. Mortal enemies check each other out as a Lion circles around for another go at the carcass. 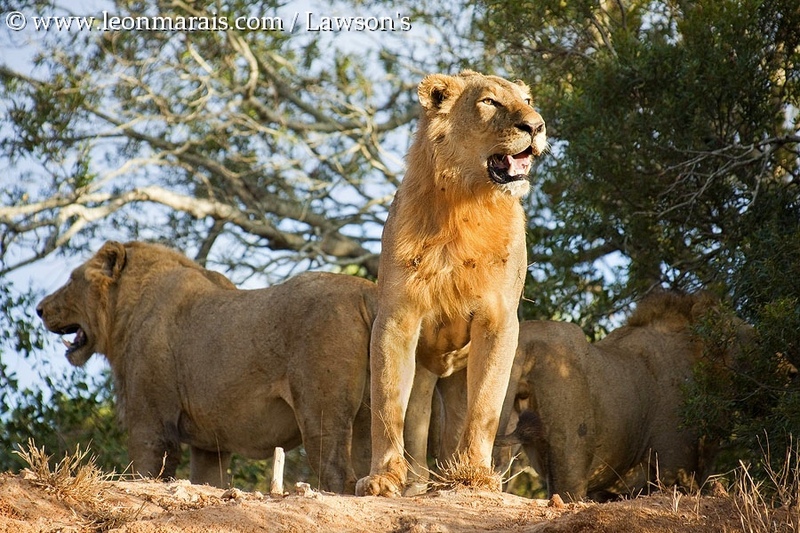 Finally the Buffalo move off and the Lions can tuck in to their spoils. 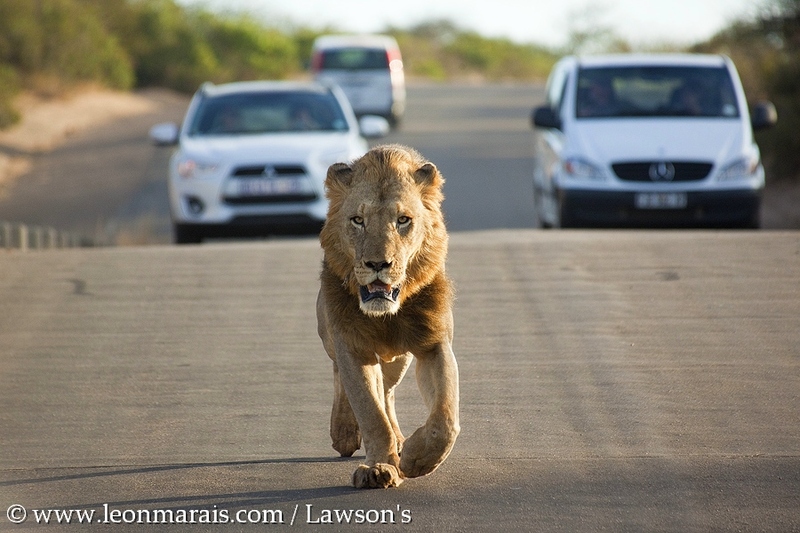 On the 3rd September 2014 Lawson’s guide Leon Marais and his clients – a family of three – were on a morning drive out of Lower Sabie Rest Camp. This camp is situated on the southern bank of the Sabie River and offers some wonderful scenery and ambiance, not to mention what is arguably the best game viewing in the entire park. 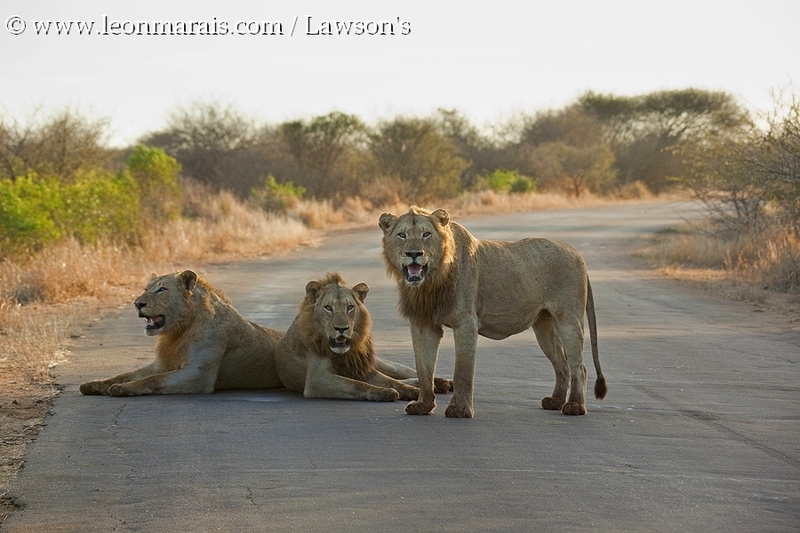 They had encountered a clan of Hyena’s near the camp gate as they exited at 06h00, and then checked out the scene at Sunset Dam before heading down to the causeway bridge over the river. With the early morning sun shining from the east, the scene looking westwards towards the camp upriver was sublime – Hippo’s breaking the surface of the water here and there, bird species of many different types just beginning their day, a thin layer of cloud breaking up as the sun warmed the earth… All quiet and peaceful when suddenly a male lion ran across the road in front of them and disappeared into the bush on their left. Photo Tip: Servo / Continuous Mode Auto Focus. When you have an animal running towards you, such as in the case of photos 3 and 4, switch your focus mode to AI Servo in Canon or Continuous in Nikon. This allows you to keep the face of the animal in focus as it closes the distance, without having to regain focus with every centimeter of movement. You just keep the shutter button half way down and the camera keeps it in focus the whole time. I don’t like this more for composing portraits etc, but when an animal is on the move, this is the way to go. Males A and B of the trio, looking pleased with themselves. The first male comes raring back across to the northern side of the bridge. He soon turns tail and runs back to the southern side. The three have now claimed the northern end of the bridge. The other male appears again and is chased for a second time. Photo of the day: Leopard under Shabeni. This could actually be titled “Sighting of the Year” instead. I was on a day trip into the Kruger National Park, with a wonderful couple from Canada, taking in the birds and wildlife on a late November day as my final foray into the Kruger for the year of 2013. I picked Justene and Christo up at Skukuza Rest Camp, where they were staying, and decided to head down towards Pretoriuskop Rest Camp for some birding. I chose the Pretoriuskop area because the broadleaf woodland habitat holds a few birds which are not often seen in the other parts of the southern Kruger. The vegetation type is known as Pretoroiuskop Sourveld, and is characterised by dense woodland and tall stands of thatching grass, which make a great environment for the birds but which is not ideal for the grazing animals. Animal density is therefore relatively low, and this is not the best place in which to see big game. Indeed, if you were after cats specifically you’d be wiser to concentrate your efforts on the Skukuza / Lower Sabie region. Anyway, we started off with a wonderful Spotted Hyena sighting not far out of Skukuza, with two adults and two tiny pups at a den in a concrete drainage pipe under the road. We then birded our way to Lake Panic, where we had a productive session in the hide, before making our way to the nursery for a cup of coffee and some snacks. With a quick stop at the golf club we bagged the Broad-billed Roller, which was perched exactly as predicted in the big dead tree in the middle of the waterhole in front of the club house, before heading on towards Pretoriuskop for some lunch. I then decided to take the loop road around Shabeni, the massive granite dome located north-west of the camp. We were spotting birds as we came to the base of the koppie when suddenly Justene burst out with that wonderful word – “Leopard!!! !” “Where?” I answered, as it was in my blind spot where the windscreen and the driver’s window meet. 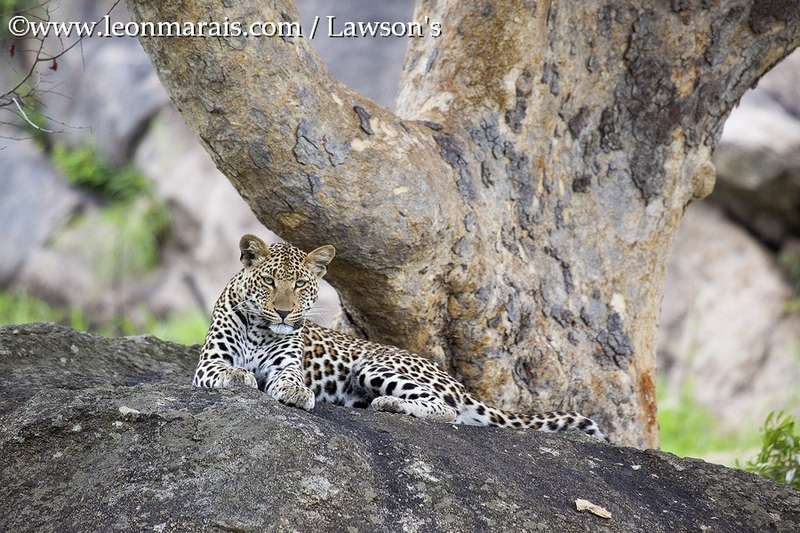 “There, on the rock!” she answered, and sure enough, there she was, a small female Leopard lying on a rock under a large Fig Tree. She was incredibly cooperative, we were the only people there for the first ten minutes or so, and we must have spent nearly half an hour watching her before she got up, crossed the road in front of us and disappeared into the bush. This was not an everyday sighting. Far from it in fact, as you can go through a whole year without having one quite as good as this. And that’s the irony – despite all your skill at spotting, your knowledge of animal behaviour, your knowledge of the park, your planning, time and effort, it’s often just lady luck who has the final say. Photo of the week: The Camp Cat. While the big cats – Lion, Leopard and Cheetah – are the most sought after animals on any safari, the Kruger National Park region is home to three smaller species of cat, the Caracal, Serval and African Wild Cat. Caracal is a very scarce, Serval is seen now and then, but if you visit Satara Rest Camp, there are good chances of seeing African Wild Cat. And you don’t even have to go on a night drive to have a chance of seeing this forerunner of the domestic cat. 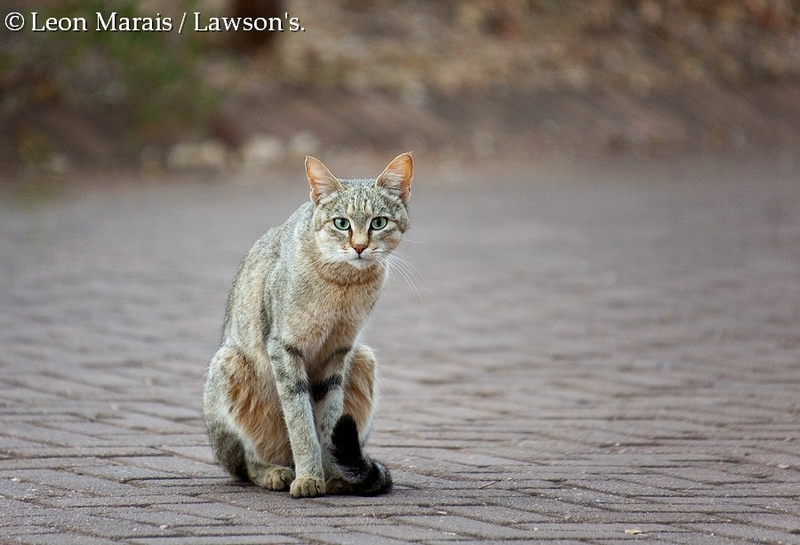 In a classic example of how cats perhaps became domesticated in the first place, one or more African Wild Cats have recently taken up residence within the camp grounds. We’re not quite sure how many there are in the camp, perhaps two at most, but for now we’ll assume that it’s one cat. At first it was really skittish, only venturing in among the huts late at night. Over time, and with people feeding it meat from their braais (the local version of the barbeque) – incidentally feeding of any animal in a National Park is actually prohibited – it has become very used to people and will approach to within a few feet. There are also resident Honey Badgers within the camp, and the great thing about doing your own braais, as opposed to eating in the restaurant, is that you generally see more nocturnal wildlife. But back to the camp cat – the bottom line is that African Wild Cat has gone from an occasional record to close to a guarantee, as long as you are staying at Satara. On this particular occasion the cat came past my hut early in the morning, before the sun was up. Lighting conditions weren’t great and I was hand holding my camera, so I had to bump up the ISO to 1250 to even hope for a sharp shot. Fortunately, one was sharp, a reminder that, if conditions aren’t favourable, you need to take a lot of photos to increase your chances of getting one or two winners.